Gain Momentum with Live Domain Data! Streaming, aka real-time/ live data processing, is the next evolution of the big data phenomenon. With the amount of data being generated in today’s time, approximately one zettabyte annually – the model of data analytics which is widely used currently i.e. the collection of data and then performing analytics is becoming increasingly cumbersome. With streaming live data, you no longer have to resort to capturing, storing and then extracting valuable data, since you can gain insights more quickly, as and when things are happening! Live data also helps professionals to be more active in their actions instead of only reacting to events after some time. This can help them in gaining a significant competitive advantage as well. Acting on data the moment any change occurs, helps get better results as well. The domain industry is expanding exponentially. With more than thousands of domains being registered and deleted every hour, keeping a tab on them is no easy feat. 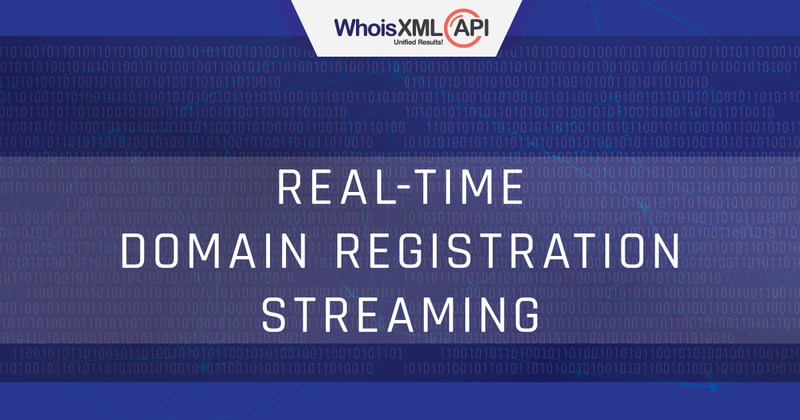 WhoisXmlApi now has a simple solution for that, Real-time Domain Registration Streaming! Our service provides data feeds of registered domains along with its Whois data, generated in real-time via live-feeds.